Keep plastic wrap, foil, parchment paper and other kitchen rolls organized and easy to reach with this adjustable rack. Simply position the eight dividers to hold boxes of any size, or create a convenient dispenser for plastic storage bags and sandwich bags. 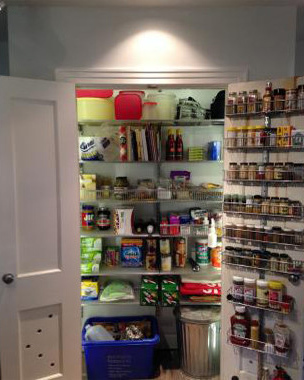 Designed to maximize space inside a cabinet or pantry, there's no need for installation or hardware. YouCopia White StoreMore Adjustable Foil & Wrap Organizer is rated 4.4 out of 5 by 8. Rated 5 out of 5 by PrincipalD from Organization - yeah It is always hard to organize the bags, foil, parchment paper - this is the solution. Quick to put together - easy access and sturdy when taking items in a out! Must have for the pantry. Rated 4 out of 5 by Minne from Good but has its limitations I should have looked closer at the bottom of this product. This is completely my fault. However, I thought I would write a review to bring this to the attention of other people considering this product. It does not have a flat bottom, and I have wire shelves in my pantry. This product holds the boxes just fine, but it does not stay upright. I will have to get something to lay over my shelves in order to have a flat surface for it to rest upon. If you have a flat surface for it, it should work great. Rated 4 out of 5 by CSfan2 from Clever Normally I store these wraps in a kitchen drawer. However, this did not work in my daughter's kitchen where her young children could access the boxes (some of which have cutting edges). This rack allows the wraps to be stored in an upper cabinet in a space-efficient manner. We put it in a pantry cabinet which is 24" deep and the boxes can slip out the back end (which is why I did not give it 5 stars). I would suggest that it might work better in a 12" deep upper cabinet. On the flip side, not having a back to stop this sliding enables you to put any length of box on the "shelf". Nice that the dividers can be adjusted to accommodate various box dimensions. Have only had it a few weeks at this time so we'll have to see if the sliding becomes an issue. Rated 5 out of 5 by DyzneeFan from Wrap Rack I love this! I bought it on impulse while shopping for other items, and I’m so glad I did! The rack is easy to put together and easily fits in either a cabinet or shelf. It neatly holds several boxes of wraps and/or bags. No more digging through a pile of wrap boxes to find the bag or roll I need! Is it light weight or heavy? Is it going to fall over every time I grab something off of it?